The bottle: Does any illustration better capture what makes a New Zealand summer great than the label on my bottle of Bach Brewing’s Beachstone Pilsner? You’ve got pohutukawa trees in full bloom, sun, sand, and surf. The only thing that’s missing is a barbecue and a couple of beers. 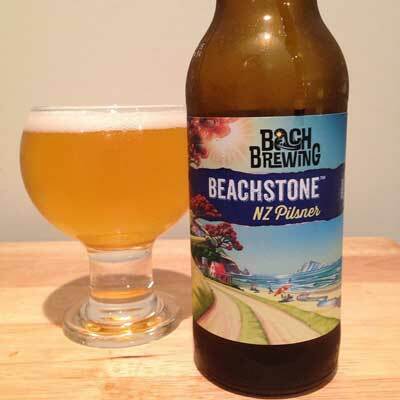 So Bach Brewing’s Beachstone Pilsner certainly looks the part – but will one swallow make a summer? About the beer: Beachstone is plied with punchy NZ hops, including Pacific Jade, Riwaka, Pacifica, Motueka, Nelson Sauvin, and a solid and juicy malt base – obvious when you smell and taste the beer. The bitterness is for grownups and might make regular “green bottled” lager drinkers cry a little, and cower in the corner. About the brewery: New Zealand craft brewery Bach Brewing is a family owned gypsy brewing company located between the shores of Auckland’s harbours. Our passion is brewing fresh aromatic beer that complements our coastal way of living. Tastes like: A brilliant summer’s day, even though I’m drinking it on a decidedly grey and windy Auckland day in spring. Still, I’m feeling pretty good because I know that better weather is just around the corner and, jackpot, this beer is everything I look for in a craft beer pilsner. That is, its fruity hop-forward character is the perfect tonic for forgetting about the boring mainstream pilsner on tap at my local pub (and most pubs here in Auckland). Here’s looking at you Monteith’s; you boor me and my taste buds to tears. Not like Bach Brewing’s Beachstone Pilsner, which is a Kiwi take on the classic European pilsner. It’s fruity – but not overly so – with a lovely aroma of mango, peach and passionfruit, and a slightly grassy, dry finish. It’s a solid session beer, too, although I’m afraid I only have time for one just the one right now. Still, something tells me I’ll be having a few more Beachstone Pilsners when the summer finally arrives in New Zealand. What else should I drink? I can also recommend Bach Brewing’s Duskrider Red IPA, which recently took out the US ale category at the 2015 Brewers’ Guild of New Zealand Beer Awards. Check it out and let me know what you think.